Our co-founder Todd Carmichael is the kind of guy who wants to reinvent the wheel – in the best way possible. Yes, the wheel works great, just like you can get a seriously great cup of coffee from a Chemex. But Todd is obsessed with driving innovation in coffee. 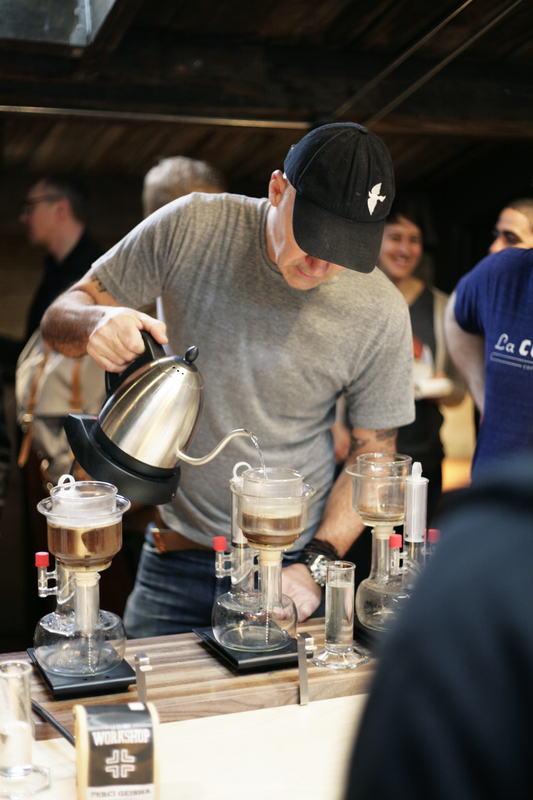 So while he was waiting to compete in the 2014 National Brewer’s Cup, he decided to invent the Dragon, a totally custom glass brewer that gives you maximum control over your coffee. It looks crazy, we know. And the science behind it is even crazier. It’s all about controlling the temperature curve, or in other words, controlling the way coffee cools down or heats up over its brewing time. It uses a special water chamber and a siphon draw-down so that you can play with the flavors in your cup, bringing out your favorite profiles. Like a more lemony or fruity coffee? You can bring those flavors forward, and vice versa. If you want to learn more about the Dragon and play around with this unique piece of coffee technology, we’re holding a public class on August 20th. Our Coffee Geeks will walk you through brewing on the Dragon, as well as get into extraction theory. It’s a hands-on class that makes a great weekday evening adventure. After this class, you’ll fully appreciate the science that is coffee. Reserve tickets here. Thanks for sharing this blog. But I need more explanation’s about this topic. I am waiting for this explanation’s.